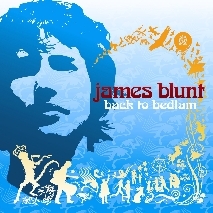 Back to Bedlam is the debut studio album by English singer-songwriter James Blunt. The album was released on 13 June 2005 in the United Kingdom. The album was a major commercial success, topping the albums charts of over ten countries, as well as reaching number two in the United States and three other countries. Back to Bedlam sold 12 million copies worldwide and was the highest-selling album of 2005 in the UK, with almost 2.4 million copies, and was the best selling album of the decade in the UK. Even though it received generally positive critical reception, NME (New Music Express, a UK magazine) awarded the album with the Worst Album Award at the 2006 NME Awards. Eight of the ten songs on the album were licensed for use in television shows, movies, advertising campaigns and/or promo/trailer spots a total of 34 times. This included "Tears and Rain", "So Long Jimmy" and "Cry", tracks that had not been released as singles. The album was the best selling album of the decade 2000-2009 in the UK.Radio 1 chart of the decade, 28th December 2009. James Hillier Blount (born 22 February 1974), National Archives, England & Wales, Birth Index: 1916-2005 volume 6b, page 446 confirms birth as Q1, 1974 better known by his stage name James Blunt, is an English singer-songwriter and musician, and former army officer, whose debut album, Back to Bedlam and single releases, including "You're Beautiful" and "Goodbye My Lover", brought him to fame in 2005. His repertoire can be best described as a mix of acoustic-tinged pop, rock and folk. After recording on the independent American label Custard Records, Blunt won two BRIT Awards, two Ivor Novello Awards, and by 2006 was nominated for five Grammy Awards. The following year, he released his second album All the Lost Souls (2007). Blunt's third studio album, Some Kind of Trouble, was released in November 2010. Worldwide, Blunt has sold over 15 million albums. Blunt was an officer in the Life Guards, a Cavalry regiment of the British Army, and served under NATO in Kosovo during the conflict there in 1999. While posted to Kosovo, Blunt was introduced to the work of MÃ©decins Sans FrontiÃ¨res (MSF or "Doctors Without Borders"). Since then, Blunt has supported MSF by holding meet-and-greet auctions at many of his concerts. James Blunt was born at an army hospital in Tidworth, Wiltshire, England; the first child born to Jane A.F. ( Amos) and Charles Blount. James spent his early childhood living in England, Cyprus, and Germany, while his father, a Colonel in the British Army Air Corps, and military helicopter pilot, was posted at various times. James Blunt has two younger siblings. His father instilled in him a love of flying, and he earned his pilot's licence at age 16. The Blount family has a long history of military service, dating from the 10th century. Blunt was educated at two independent schools: at the age of seven, he was enrolled at Elstree School in Woolhampton in Berkshire, before continuing to Harrow School in Harrow on the Hill in north-west London (Elmfield House) on an army bursary. From Harrow School he gained an army-sponsored place at the University of Bristol, where he first studied Aerospace Manufacturing Engineering and then subsequently moved on to the study of Sociology. He graduated with a BSc(Hons) in Sociology in 1996. Because the British Army sponsored his university education, Blunt was obliged to serve a minimum of four years in the armed forces. James stated on an interview in his Back to Bedlam sessions that he chose to join the military as "his Father was pushing for it, so that Blunt could obtain a secure work placement and income". Blunt trained at the Royal Military Academy Sandhurst. He was commissioned as a second lieutenant in the Life Guards, a unit of the Household Cavalry, where he rose to the rank of captain. One of his first assignments was to British Army Training Unit Suffield in Alberta, Canada, where his battalion was posted for six months in 1998 to act as the opposing army in combat training exercises. In 1999, he served as an armoured reconnaissance officer in the NATO deployment in Kosovo. Initially assigned to reconnaissance of the Macedonia-Yugoslavia border, Blunt and his unit worked ahead of the front lines directing forces and targeting Serb positions for the NATO bombing campaign. His unit was given the assignment of securing the Pristina International Airport in advance of the 30,000-strong peacekeeping force; the Russian army had moved in and taken control of the airport before his unit's arrival. According to Blunt's own account of the incident he refused to follow orders from NATO command to attack the Russians. There were less intense moments during Blunt's Kosovo assignment, however. Blunt had brought along his guitar, strapped to the outside of his tank. At some places, the peacekeepers would share a meal with hospitable locals, and Blunt would perform. It was while on duty there that he wrote the song "No Bravery". A keen skier, Blunt captained the Household Cavalry Alpine Ski Team in Verbier, Switzerland, eventually becoming champion skier of the entire Royal Armoured Corps. He had extended his military service in November 2000, and after an intensive six-month army riding course was posted to the Household Cavalry Mounted Regiment in London, England. During this posting, Blunt was interviewed about his responsibilities on the television programme "Girls on Top", a series highlighting unusual career choices. He stood guard at the coffin of the Queen Mother during the days of her lying in State and was part of the funeral procession on 9 April 2002. Blunt left the army on 1 October 2002 having served six years. Blunt took piano and violin lessons as a child, but his first significant exposure to popular music was at Harrow School. There, he was introduced to the guitar by a fellow student, and started playing guitar and writing songs at age 14. At University of Bristol, his undergraduate thesis was The Commodification of Image â€“ Production of a Pop Idol; one of his main references for the thesis was Simon Frith, a sociologist and rock critic, and current chair of the Mercury Music Prize. Blunt left the British Army in 2002 so that he could pursue his musical career. It was at that period of time that he started using the stage name "Blunt", in part to make it easier for others to spell; "Blount" is pronounced the same way, and remains his legal surname. Shortly after leaving the Army, he was signed to EMI music publishers, and to Twenty-First Artists management. A record contract remained elusive however, with recording label executives pointing to Blunt's "posh" speaking voice as a barrier in class-divided Britain. Linda Perry, who was just launching her own Custard Records label in early 2003, heard Blunt's promotional tape when visiting London, and soon after heard him perform live at the South by Southwest Music Festival. She made an offer to him the same night and within a few days, Blunt signed a recording contract with Perry, and one month later he was in Los Angeles working with producer Tom Rothrock. Blunt recorded Back to Bedlam in 2003 with producer Tom Rothrock at Rothrock's home studio, using session musicians and performing on many different instruments himself. While in Los Angeles, he lodged with actress Carrie Fisher, whom he had met through the family of a former girlfriend. Fisher was very supportive of Blunt's aspirations, suggesting the name of the album and providing use of a bathroom in her home for Blunt to record the song "Goodbye My Lover". Back to Bedlam was finally released in the UK in October 2004. Blunt's debut single in the UK was "High" (co-written with Ricky Ross of Deacon Blue). This song initially peaked below the Top 100 of the UK Singles Chart, however after the subsequent success of You're Beautiful it finally made the Top 75 before eventually being re-released. However, the song was chosen to appear in a Vodafone commercial in Italy, and was a Top 10 hit in that country. The debut album from the unknown Blunt initially attracted little critical attention, and there were no published reviews from major UK music journals. His live performances, mainly in support of better known musicians, received somewhat mixed but generally favourable reviews. Blunt's lack of performing experience and inconsistent approach with audiences was commented upon, while his music was likened to that of Damien Rice and David Gray. In March 2004, with Blunt performing in the support role for Katie Melua in Manchester, Alex McCann of Designer Magazine wrote, "Blunt's ascendance is a dead cert and this time next year it isn't that far removed from reality to suggest that a number 1 album, Brit Award and countless accolade's will be his for the taking." After release of the album, Concert support slots for Elton John and Lloyd Cole and the Commotions in late 2004 and early 2005 followed, as did a band residency at London club 93 Feet East. In March 2005, his second single, "Wisemen," was released. Blunt's third single "You're Beautiful" was his break-out hit. The song debuted at number 12 in the UK, and rose all the way to the number one position six weeks after its debut. The song also received massive airplay in the UK, which helped propel Back to Bedlam to number one on the UK Albums Chart. The extensive airplay ultimately led to Blunt and his co-writers being awarded the Ivor Novello Award for Most Performed Work. After the success of "You're Beautiful" in the UK, the song crossed over to mainland Europe, becoming one of the biggest hits of summer 2005 across the continent. In the U.S., "You're Beautiful" made its debut in the summer of 2005 on WPLJ, a prominent radio station in New York City, despite not having been released to radio yet. Once the song was released to radio stations in the fall of 2005, the song climbed into the Top 10 at three radio formats: Adult Contemporary Music, Hot Adult Top 40 Tracks, and Adult album alternative. Blunt became the first British artist to top the American singles chart in nearly a decade when his song "You're Beautiful" reached number one on the Billboard Hot 100 in 2006; the last British artist to do so had been Elton John in 1997 with the song "Candle in the Wind 1997". "Goodbye My Lover" was released as the fourth UK single from the album in December 2005, and was later the second US single. The songs "High" and "Wisemen" were subsequently re-released in 2006. Blunt started off 2006 celebrating five BRIT Award nominations, going on to win Best British male solo artist and Best pop act categories, having already started an 11-month tour that would take him around the world. There was extensive promotion in the United States starting in the fall of 2005, with Blunt making appearances on The Oprah Winfrey Show and as a musical guest on Saturday Night Live. Eight of the songs on the album were featured in television shows (The O.C., Grey's Anatomy and many more), films (Undiscovered), and advertising campaigns (Hilton Hotels, Sprint telecommunications) throughout 2005 and 2006. Blunt performed "You're Beautiful" at the 49th Grammy Awards in February 2007, dedicating the song to the late Ahmet ErtegÃ¼n of Atlantic Records, but he did not win in any of the five categories for which he had received nominations (includes one for Best New Artist Grammy, but lost to Carrie Underwood). The album eventually sold 11 million copies and topped the album charts in 16 territories worldwide. It sold 2.6 million in the U.S. and was certified 2x platinum. In Britain the album was certified 10x platinum, sold over three million copies, and entered the Guiness Book of World Records for the fastest selling album in one year. In 2005, Blunt performed in 90 live shows, mainly across the UK and Europe, ending the year supporting Jason Mraz in a North American tour. The "Back to Bedlam World Tour" started off in January 2006, covering cities in Europe, the UK, Australia, New Zealand, and Japan, as well as three separate headline tours in North America, ending in November of that year. Not including promotional appearances, Blunt performed over 140 live shows in 2006. He enjoys the touring experience, saying in July 2006 that he and his band were having the time of their lives going to new places every day. The videos for all of Blunt's singles released from Back To Bedlam feature symbolism and dark imagery. In the first video for "High", he is buried in a desert. In the first video for "Wisemen", he is kidnapped and taken hostage. In the video for "You're Beautiful", he alludes to suicide by jumping off a cliff into the sea. In the "Goodbye My Lover" video, he is the outsider in a love triangle, imagining the couple, a man and woman (played by Matt Dallas of Kyle XY and Mischa Barton of The O.C.) together. The re-release video for "High" features Blunt running in a forest. The re-release video for "Wisemen" has Blunt burning identification papers, and then walking through a forest while he is on fire. Blunt appeared on an episode of Sesame Street which aired 14 November 2007, singing about triangles to the tune of "You're Beautiful". A parody of "You're Beautiful" titled "You're Pitiful" was recorded by Weird Al Yankovic. Blunt gave personal permission for this parody to be included on a Weird Al album, but Atlantic Records, Blunt's label, stepped in to forbid the commercial release of the song. Weird Al has since made the song available as a free MP3 download on his website. In a request by Yankovic to include the song on an upcoming compilation CD, Blunt's manager replied via email, "Thanks for your email, but both James and I will never approve this parody to be released on any label.". On 28 December 2009, BBC Radio 1 announced that Back to Bedlam was the biggest selling album of the noughties decade in the United Kingdom. Blunt's second studio album, All the Lost Souls, was released on 17 September 2007 in the United Kingdom and one day later in North America. It sold 65,000 units in its first week, and was certified gold in the UK after only four days. By the end of January 2008, the album had sold 600,000 copies in the UK, and 4.5 million copies internationally. Blunt completed the album's songs at his home in Ibiza in the winter of 2006â€“2007. He performed five of the ten album tracks during his 2005â€“2006 tours; lyrics, melodies, and harmonies were refined for the studio recording, on which his touring band played and Tom Rothrock worked as producer. The first single from All the Lost Souls, "1973", was inspired by Blunt's nights out at Pacha, an Ibiza club, which opened in that year. The song became another hit for Blunt reaching number one the Billboard European Hot 100 Singles chart. D.J. Pete Tong remixed "1973" and played the track during his set at Pacha over the summer of 2007. The second single, "Same Mistake", was released in early December 2007 but did not fare well in the UK charts, peaking at number 57. It was Number 1 in Brazil and a hit in many South American countries. The third single from the album was "Carry You Home", released in March 2008, peaking at number 20 in the U.K charts and bringing the album back into the Top 10, six months after its release. The fourth and final single from the original "All The Lost Souls" album was "I Really Want You". Blunt collaborated twice during this album cycle. In the end of 2007, he worked with French rapper Sinik. They released "Je RÃ©alise", which took elements of Blunt's song "I'll Take Everything", which hit the top 3 in France. On 14 November 2008, "Primavera in anticipo", Laura Pausini new album, was released. The title track is a duet with Blunt. The album reached the Number 1 in Italy. Throughout 2007 and 2008, Blunt went on his second world tour, including a performance in London's O2 Arena. On 24 November 2008, All The Lost Souls was re-released as a deluxe edition, with new album artwork, new single "Love, Love, Love" and the documentary James Blunt: Return to Kosovo. James Blunt's third studio album titled Some Kind of Trouble, was released on November 8, 2010. The album debuted at #4 in the UK with over 100,000 copies sold in the first week. The album's first single "Stay the Night" was released on October 27, 2010. The single charted in the UK top 40 at number 37. The second single from the album, "So Far Gone" is due for release in the UK on January 3, 2011. Overall critical reception has been mixed and as of February 2011, worldwide sales stand at over one million copies, making it a commercial success.http The third single from the album, "If Time Is All I Have" is due for release in the UK on April 4, 2011. James Blunt 2011.jpgthumbJames Blunt in Cannes, at the NRJ Music Awards 2011. Blunt says that he has become closer to his family since his musical success. His father manages his finances and his mother arranged for the purchase of his principal residence in Ibiza, where Blunt has holidayed since he was a teenager. Blunt also owns a chÃ¢let in the Swiss town of Verbier, which he purchased in February 2007, and he was named "godfather" of one of the town's new ski lifts. Blunt was instrumental in introducing his sister to her eventual husband after offering her for "sale" on eBay. She was having difficulty obtaining transport to a funeral in Ireland, and Blunt listed her as a "damsel in distress". A person responded saying his friend had a helicopter his sister could charter, but it turned out he was in Sweden and she did not attend the funeral. But the respondent suggested she still meet up with the helicopter owner, Guy Harrison, and they began a relationship and eventually married. The musician's social life has been the subject of significant commentary, particularly in the tabloid press. Blunt himself has found the degree of interest in his personal life to be bizarre, stating that "fame and celebrity is something that other people have constructed that I'm not really party to". Blunt has raised funds for the medical charity MÃ©decins Sans FrontiÃ¨res through benefit concerts and by auctioning opportunities to meet him at his own shows. He first encountered MSF medical care workers during his tour of duty in Kosovo, and was impressed with their work despite minimal support and limited security. He also supports environmental causes, screening the trailer for An Inconvenient Truth at his concerts, and planting a tree for each advance sales concert ticket purchased through his designated website. On 7 July 2007, Blunt performed at the Live Earth concert at Wembley Stadium, London, and is the owner of one of two prototype electric cars made by Hybrid Technologies under a Space Act partnership with NASA. As a former soldier, Blunt is a patron of Help for Heroes, a charity aiming to raise money to provide better facilities for wounded British servicemen, and has also held benefit concerts for this charity. Blunt has also contributed with his vocals for the charity single, "Everybody Hurts" in aid of the 2010 Haiti Earthquake Appeal. James Blunt.jpg250pxthumbJames Blunt in July 2006.